New year, new start and, best of all, new makeup! Now that we’re officially into 2012, it seems appropriate to bring you this round-up of all the loveliness the beauty houses will be sending our way next season. Delicate pastels and soft colour palettes are par for the course for spring, but this year the collections seem particularly pretty and romantic -- and it's all about the cheeks! 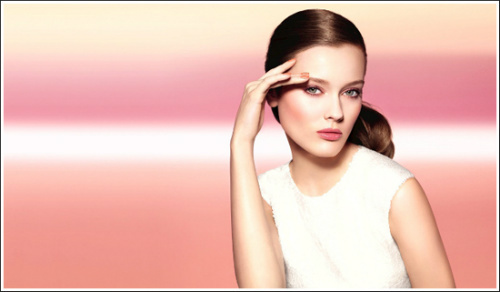 Feast your eyes on the campaign images from three of my favourite luxury brands. Chanel Harmonie de Printemps: Inspired by the dawn light, Peter Philips, Global Creative Director of Chanel Makeup, has created a collection comprised of pink, coral and peach shades with contrasting garnet tones. The star of the collection is the beautiful Blush Horizon with shades of dawn and sunset. Available from the 27th of January. Clarins Colour Breeze: Launching in February, the spring collection from Clarins sees bright teal and sea green hues contrasted with soft pink, bronze and coral. The collection includes 8 new shades of Gloss Prodige lipgloss but it's the limited edition liquid blushes that are the most eagerly anticipated. 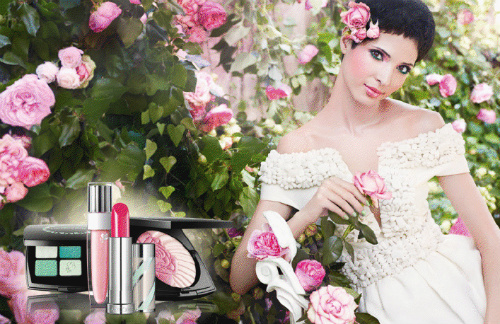 Lancôme Roseraie des Délices: Lancôme’s Make-up Artistic Director Aaron De Mey was inspired by rose gardens and macaroons when he created this gorgeously feminine collection, on counter now. Check out this post for a look at some of the products in the pistachio-and-rose themed collection. The La Roseraie blush compact takes centre stage. Let me know if you'd like more info or product shots from any of these collections! Which new releases are you looking forward to the most? Love love love the new Lancome collection - been wearing the nail polish for a couple of weeks and everyone keeps asking me where they can get it! Cheers guys - can't wait to try out all the new collections!